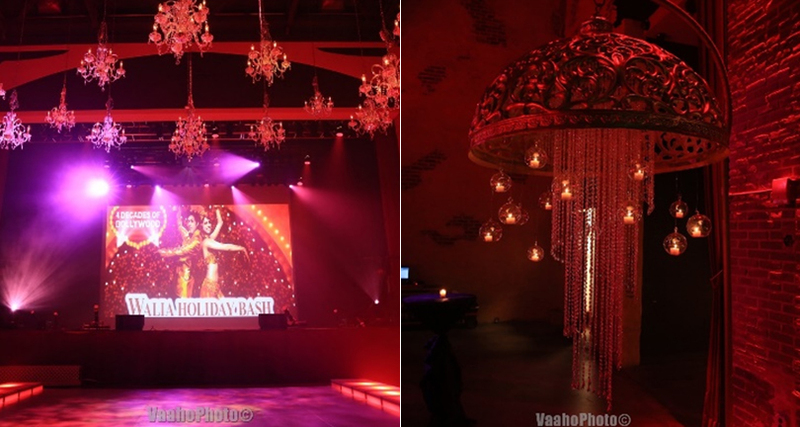 Glamorous Event Planners in NY celebrated four decades of Bollywood with Mr. Arvind Walia with the theme BOLLYWOOD COCO BONGO! Welcome to our fifth collaborative extravaganza with Mr. Arvind Walia. As always, it was an honor celebrating with him and the many colors of Bollywood throughout the ages. 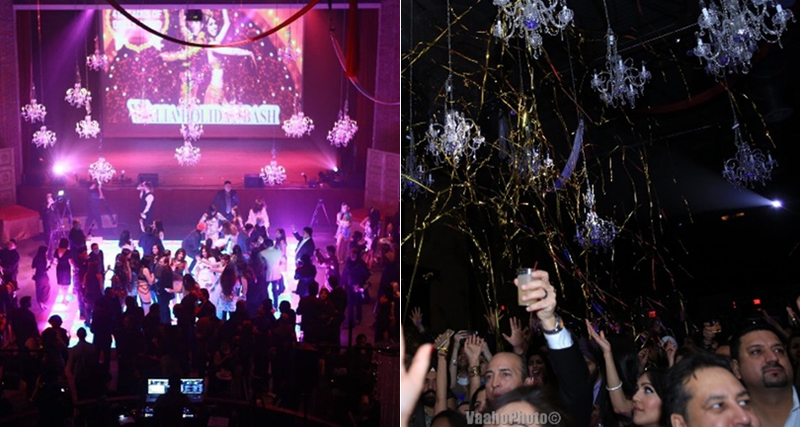 It was held at The Space in Westbury which is an old movie theater turned night club. To start off the festivities, guests were escorted into the lobby down a red carpet, paparazzi included! They were ask to say a little something about themselves and the guest of honor for the cameras and yes of course they were also asked “Who are you wearing”? This special red carpet entry added a feeling of honor and grandeur to the event. 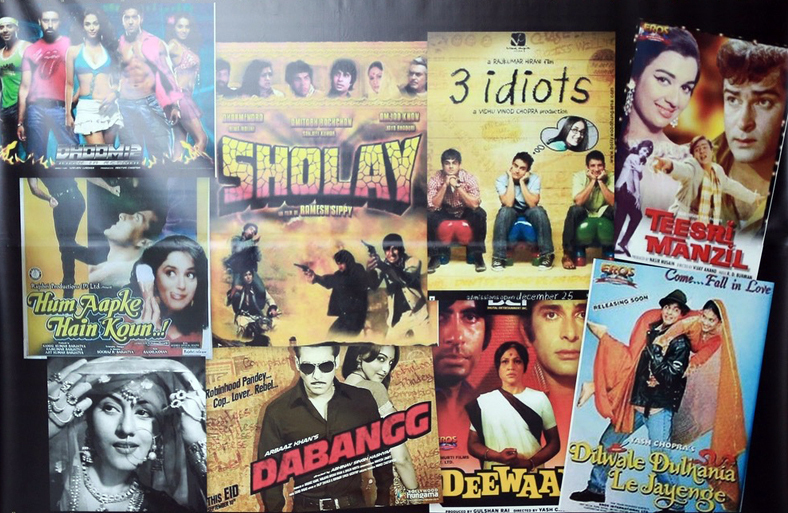 Giant Bollywood movie posters adorned the lobby. 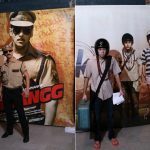 “Dabbang” & “PK” were only two of the posters featured with true life models standing beside them, dressed to the “T”, mirroring the celebrities in the posters! 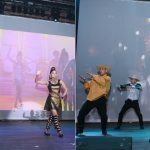 Guests enjoyed posing for photos and taking selfies with the models dressed as the celebrities from the movie, it was as if the guests were part of a “true to life” Filmfare Awards Show! 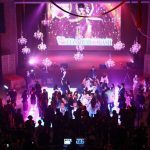 Jaw Dropping Decor and Entertainment! After cocktail hour, guests poured into the grand theater where they were wowed by our aerial acts. 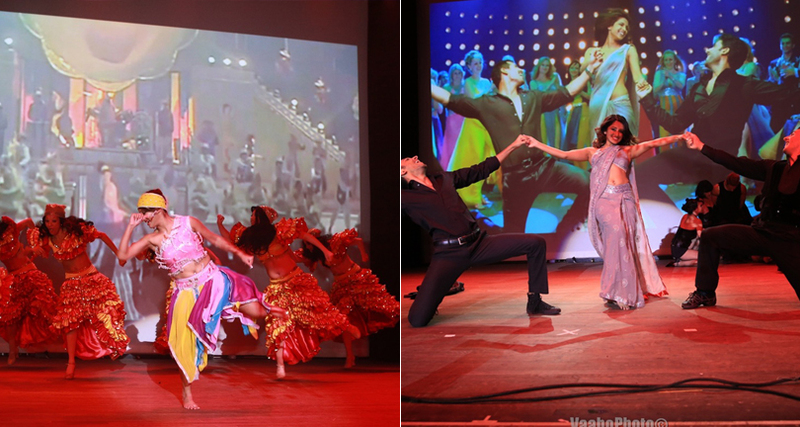 A huge LED screen placed on the stage showcased a slideshow of posters from Bollywood movies from the last 10 years. This screen later would be used to showcase the surprise Coco Bongo show planned for our grand entertainment. Made popular in Mexico, Coco Bongo is where a scene from a movie is played on a TV or movie screen and live performers mimic what’s being shown in the background. It didn’t stop there. 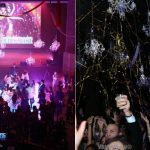 Over 27 beautiful crystal chandeliers dangled from the ceiling over the dance floor. 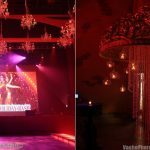 Around the room, standing giant golden chandeliers, adorned with spiral crystal showers and candles added a dramatic Bollywood night club scene. 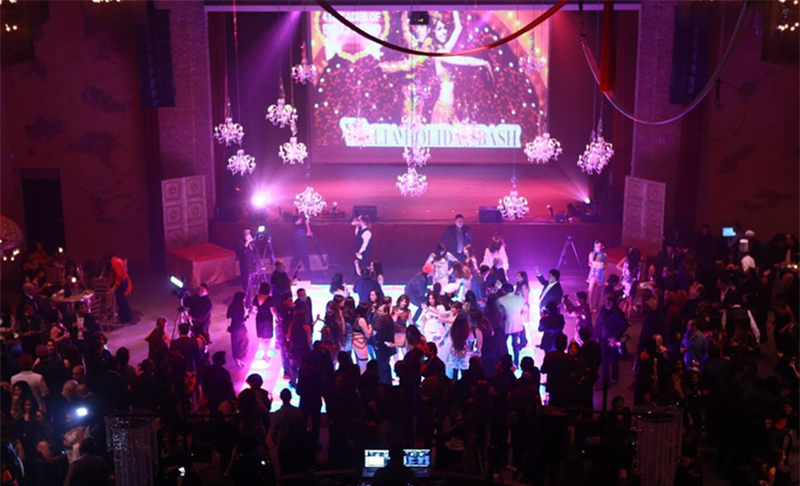 The perfect ambience left everyone mesmerized and delighted! Eat Drink and be Merry! 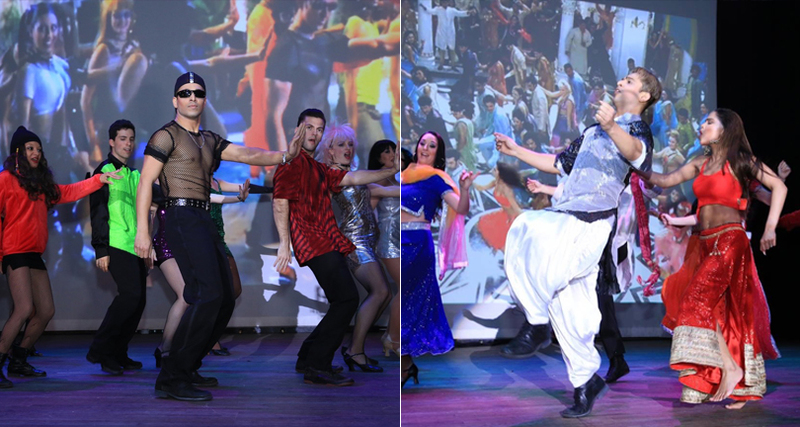 No event is complete without some dancing, masti and masala! A giant LED screened dance floor was put in place for everyone to let loose and dance to the sounds of mixed music! Not an inch of floor was seen once the party got started. 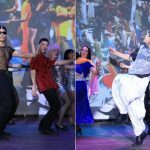 The dance floor buzzed with just the right choice of dance music from the four decades of Bollywood from 1980s, 1990s, 2000s and Present! Now to start the show…our wonderful choreographed performances went on the entire evening. A single segment about every half hour. Four in total. 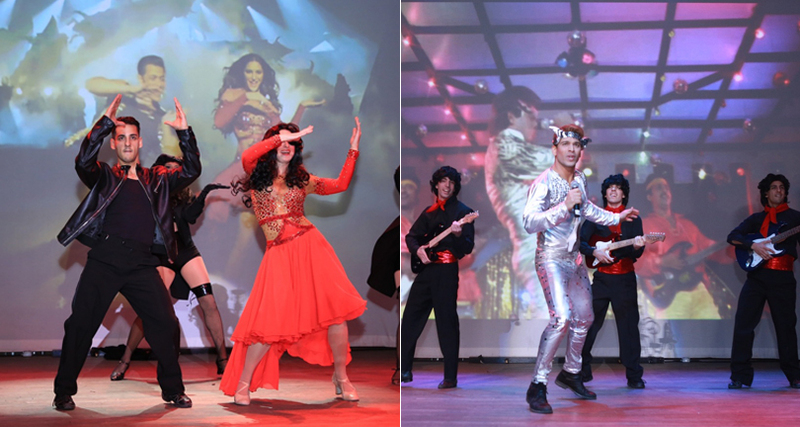 Each segment and costume was explicitly replicated and paired to reflect the exact movie scene playing in the background on the large LED screen by our wonderfully talented performers. 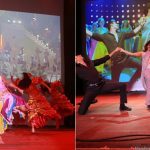 It was a very euphoric experience for the guests as they looked on, reminiscing the old times and enjoying their evening full of color, music and above all “Bollywood”.